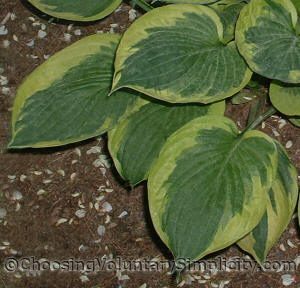 Hosta Twilight is a sport of Fortunei Aureomarginata and has dark green leaves with wide, creamy to yellow, wavy margins. The leaves are round and thick, somewhat shiny, and very slug-resistant. This hosta has been a fairly slow grower for me, although some sources list Twilight as fast-growing. The funnel-shaped flowers are lavender, have no scent, appear in late July or August, and result in a small number of seed pods. 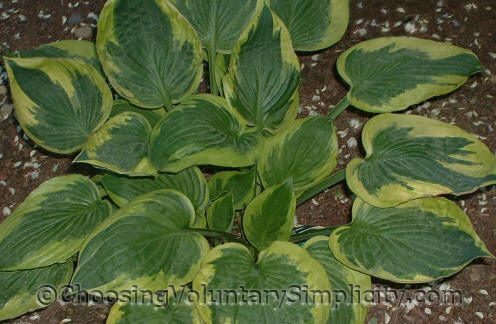 Most of the seedlings I have grown from this hosta have been the same green as the inner portion of the leaf, although a few were the very attractive yellowish lime-green of the leaf margin. 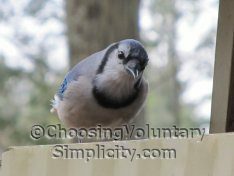 I didn’t know that you could grow hostas from seeds until I read your blog and I’m finding your comments about your seedlings very interesting. I’m wondering if perhaps sometime you could write an article and show examples of some of the hosta seedlings you have grown. I like this Hosta but I have trouble with the leaves burning around the edges very much like Francis Williams does. In fact my Twilight does this burning every year so it spends most of the time not looking very good. I wonder if moving it to more shade would help prevent the burning. I second Elyn’s suggestion. I would love to see what your hosta seedlings look like. I am just starting out with hostas and only have 2 so far but I have found them fascinating. Especially all the different looks they can have. It would be really nice if I could grow my own so to speak. I have lots of other photographs but I need to get them organized! Trent: I had the same problem with Frances Williams. Now she resides under the back deck in the shade and is happy. fyi: our zone is 5a. It gets hot in the summer but the last few years there was no necrosis at all-the leaves remained unblemished. Sometimes the heat (even in shade) affects the plant anyway but you could try and relocate it to more shade? (My Frances gets morning sun until about 10-11 am.) Good luck.